Somehow I'd not yet been out on an evening walk this spring or summer, so I decided to rectify that this evening. Blackstone Edge was somewhere I'd not been to for a while, and a quick look at a map suggested a possible circular route taking in Rishworth Moor too, so a plan was formed. So after a quick journey along the M62, I set off walking soon after 7:30pm and followed the track up to Green Withins Reservoir. A path then led me alongside a drainage ditch, before beginning to ascend up through the bracken, heading for Blackwood Edge. As this wasn't where I wanted to be heading this evening, I soon left the path and headed across the moor to reach the trigpoint on Dog Hill, the highest part of Rishworth Moor (TuMP). The ground 50m or so to the east looked to be slightly higher so I headed over there to ensure I visited the highest point. There was a lot of cotton grass blowing around in the wind up here this evening! I followed a faint path across the moorland, past Cat Stones and Warm Withins Hill to reach Rishworth Drain and another track. It was now decision time: I could either turn left along a reasonable track back to the car, or turn right and continue with my planned route up Blackstone Edge. The weather was reasonable, sunset was still half an hour away and I had two torches with me, so I opted to continue. Therefore I picked up the Old Packhorse Road, which was quite peaty in places. 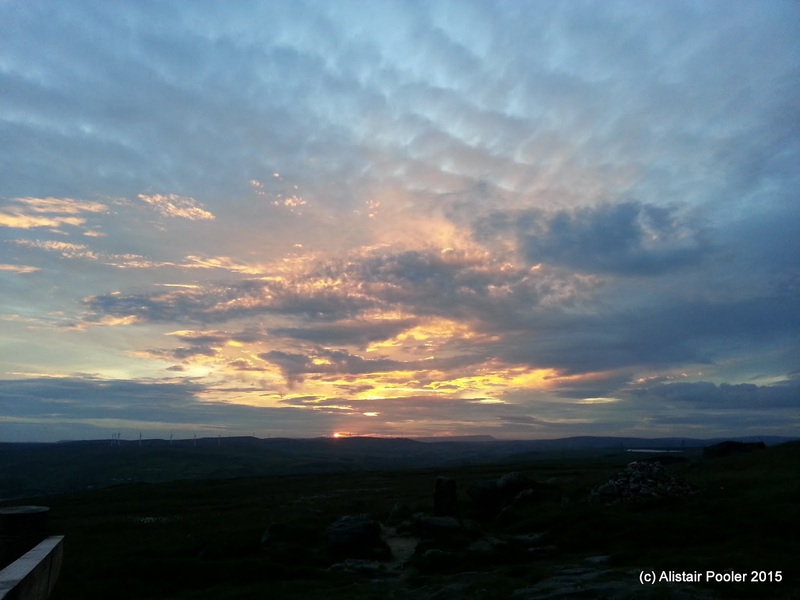 This lead me to the Aiggin Stone, where I joined the Pennine Way. After watching sunset from the Aiggin Stone, and using the nearby fenceposts as a support for my camera, I headed south up to the rocky outcrops of Blackstone Edge. Soon I reached the trigpoint, which I'd last visited back in 2008 when I walked this bit of the Pennine Way. I'd heard that the trigpoint wasn't actually on the highest point of the hill, so I headed south-east to reach the boulder that marked the summit of Blackstone Edge (HuMP), which had an OS benchmark symbol carved into it. By now it was 10pm and the light was fading, so I donned my headtorch and headed south along the Pennine Way towards the traffic noise from the M62. 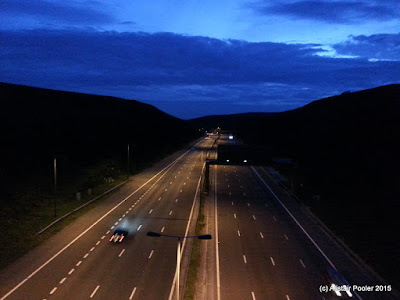 I crossed the footbridge over the motorway and headed back along the A672 to reach my car shortly before 11pm after a pleasant moorland walk.